Spermatogonial stem cells (SSCs), also known as male germline stem cells, are a small subpopulation of type A spermatogonia with the potential of self-renewal to maintain stem cell pool and differentiation into spermatids in mammalian testis. SSCs are previously regarded as the unipotent stem cells since they can only give rise to sperm within the seminiferous tubules. However, this concept has recently been challenged because numerous studies have demonstrated that SSCs cultured with growth factors can acquire pluripotency to become embryonic stem-like cells. The in vivo and in vitro studies from peers and us have clearly revealed that SSCs can directly transdifferentiate into morphologic, phenotypic, and functional cells of other lineages. Direct conversion to the cells of other tissues has important significance for regenerative medicine. SSCs from azoospermia patients could be induced to differentiate into spermatids with fertilization and developmental potentials. As such, SSCs could have significant applications in both reproductive and regenerative medicine due to their unique and great potentials. In this review, we address the important plasticity of SSCs, with focuses on their self-renewal, differentiation, dedifferentiation, transdifferentiation, and translational medicine studies. The pluripotent properties of stem cells have attracted considerable interest in both basic research and clinical applications. ,, There are three main types of stem cells, namely embryonic stem (ES) cells, adult stem cells, and the induced-pluripotent stem (iPS) cells. However, ethical issues as well as tumorigenicity and immune rejection preclude the applications of ES cells in clinic. ,, Similarly, the iPS cells encounter several severe hurdles, e.g. viral transduction, low efficiency, and tumor-causing risk,  although they can be induced to generate male germ cells. Due to these obvious drawbacks, scientists are devoting to seeking alternative sources of pluripotent stem cells from adult tissues. Notably, spermatogonial stem cells (SSCs) might become an ideal candidacy because of their unique and important plasticity, including self-renewal, differentiation, dedifferentiation and transdifferentiation. ,, SSCs are a small subpopulation of type A spermatogonia in mammalian testis where they can self-renew and differentiate to produce sperm in the course of normal development throughout life. We have recently shown that SSCs from cryptorchid patients could be induced to differentiate into round spermatids with fertilization and developmental potentials. Strikingly, numerous studies by peer and us have recently demonstrated that SSCs can dedifferentiate to become ES-like cells with pluripotency and that SSCs are able to directly transdifferentiate into the cells of other lineages in vivo and in vitro. ,,,,,,,,,,,,,,,, Here we discuss the self-renewal, differentiation, dedifferentiation, and transdifferentiation of SSCs and their potential applications in regenerative and reproductive medicine. Spermatogonial stem cells undergo self-renewal to maintain the stem cell pool while they differentiate into sperm in mammalian testis. , Spermatogonia are classified into three types, including type A, intermediate, and type B cells, based upon their morphological characteristics. Type A spermatogonia can be subdivided into A single (A s ), A paired (A pr ) and A aligned (A al ) cells. , SSCs are very rare, with only approximately 0.02%-0.03% of all germ cells in adult testis;  nevertheless, thousands of spermatids are produced each day, reflecting an unlimited potential of SSC division and differentiation. We illustrated the self-renewal and differentiation of the rodent and human SSCs in [Figure 1]. In rodents, A s spermatogonia can divide symmetrically to produce new A s stem cells or they divide asymmetrically to give rise to A s spermatogonia and A pr spermatogonia that are characterized by an intercellular cytoplasmic bridge. The A pr spermatogonia continue to divide and form chains of A al spermatogonia (4, 8, 16, and 32 cells) that are able to differentiate into type A 1 to A 4 , intermediate (In) and B spermatogonia. Type B spermatogonia further differentiate to primary spermatocytes, secondary spermatocytes, and eventually spermatids via two meiotic divisions. There are distinct cell types and biochemical phenotypes between rodent and human male germline stem (GS) cells. A s spermatogonia are generally considered the actual stem cells with self-renewal capacity in the testis while A pr and A al spermatogonia are suggested to be the potential stem cells that give rise to actual stem cells when the niche is emptied. In human, spermatogonia are classified into A dark , A pale and type B cells. The A dark spermatogonia are believed to be the reserve stem cells, while the A pale spermatogonia are thought to be the renewing stem cells that can divide into either new A pale or type B spermatogonia. Mouse and human SSCs share many, but not all phenotypic markers, as evidenced by the fact that both of them are positive for GPR125, ITGA6 (CD49f), UCHL1, GFRA1, PLZF, THY1 and Lin 28. , and that human SSCs don't express POU5F1 that is a hallmark for rodent SSCs. In addition, rodent spermatogenic lineage development is different from human. Mouse spermatogenic cycle contains twelve stages, whereas there are only six spermatogenic cycle stages in human. , Collectively, due to significant differences between species and limit investigations on human, studies are required to uncover the similarities and differences between rodent and human spermatogenesis. Figure 1: Schematic diagram showed the self-renewal and differentiation of spermatogonial stem cells (SSCs). SSCs reside on the basal membrane of the seminiferous tubules. SSCs self-renew and differentiate into spermatocyte, spermatid, and eventually spermatids. As: a single spermatogonia; Apr: a paired spermatogonia; Aal: an aligned spermatogonia; Adark: type A spermatogonia with dark nuclei; Apale: type A spermatogonia with pale nuclei; In: intermediate spermatogonia; Pl: preleptotene spermatocytes. The microenvironment or the niche precisely regulates the fate decisions of SSCs. There are differences in the roles of signaling pathways in controlling SSCs between species. For instance, JAK/STAT signaling pathway has been demonstrated to stimulate the self-renewal and maintenance of Drosophila SSCs;  in contrast, STAT3 signaling pathway is shown to be required for the differentiation of mouse SSCs. Sertoli cells, a key component of the niche, produce certain growth factors, e.g. glial cell line-derived neurotrophic factor (GDNF),  ﬁbroblast growth factor 2 (FGF2),  bone morphogenetic protein 4 (BMP4)  and stem cell factor (SCF),  that play important roles for the self-renewal and/or differentiation of SSCs. GDNF has been demonstrated to be essential for the survival and proliferation of SSCs in vivo and in vitro. ,,, We have revealed that GDNF activates CREB/ATF-1 family members and c-fos transcription via the Ras/ERK1/2 pathway to promote DNA synthesis and proliferation of SSCs. Mouse SSCs proliferate over a 5-month period when cultured with basic fibroblast growth factor (bFGF) (also known as FGF2), GDNF, leukemia inhibitory factor (LIF), and epidermal growth factor (EGF),  and both bFGF and GDNF stimulate Ras pathway via Src family kinases. , Additionally, FGF2 is required for the survival and proliferation of mouse SSCs. On the other hand, BMP4 and SCF have been shown to promote the differentiation of SSCs. Although BMP4 is unimportant for the survival of undifferentiated spermatogonia,  it can induce SSC differentiation through changing cell adhesion properties and activation of Smad1/5/8 pathway by up-regulation of c-KIT expression. , Deletions or mutations of SCF or its receptor c-KIT result in sterility in mice due to lack of differentiating spermatogonia,  implicating that SCF/c-KIT pathway is essential for SSC differentiation. SCF also contributes to the proliferation of primary spermatogonia in culture, and the division of type A 1 and A 4 spermatogonia is c-KIT-dependent. It has been reported that SCF induces mouse spermatogonial cell line to differentiate into spermatocytes and spermatids without somatic cells in vitro,  which suggests that SCF plays a crucial role for the differentiation of SSCs and gametogenesis in vitro. Retinoic acid (RA) induces meiosis of germ cells via increasing c-KIT expression. We have recently shown that SCF and RA effectively induces SSCs from cryptorchid patients to differentiate into haploid spermatids with fertilization and developmental capacity. It has been demonstrated that RA promotes the differentiation of SSCs through various kinds of mechanisms. , For example, the receptor RARa of RA can increase SCF and BMP4 expression, whereas it reduces GDNF secretion. However, currently little is known how SSCs balance the self-renewal and differentiation. To unveil more signaling molecules and pathways or targets regulating SSC self-renewal and differentiation would contribute to a better understanding the fundamental principles of stem cell biology and treatment of male infertility. To induce the differentiation of SSCs and their precursors with an objective to generate male germ cells in vitro, as we summarized in [Table 1], might provide male gametes for treating male infertility. , Early in 1910s, scientists started to examine spermatogenesis process using testicular tissue culture,  and male germ cells could enter meiotic prophase in vitro. Notably, pachytene primary spermatocytes were observed after 11 days of culture from neonatal mouse testes. Gas-liquid interphase organ culture system was developed  and it was optimized with culture parameters, e.g. temperature, incubation atmosphere, pH, nutriments (pyruvate, vitamin A, E, and C), for the differentiation of rat and human spermatogonia from testis tissues into pachytene spermatocytes. ,,, Cell culture and coculture methods were employed to probe the differentiation of SSCs in vitro. It has been reported that preleptotene spermatocytes progress toward later stages of meiotic prophase in association with Sertoli cells that provide necessary microenvironment in vitro. 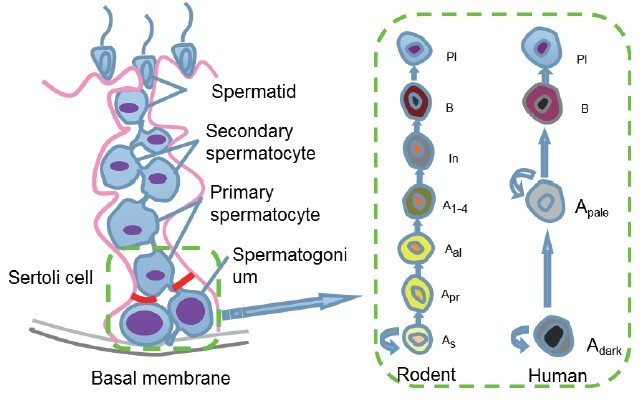 Immortalized mouse type A spermatogonial cell line was induced to generate haploid spermatids in vitro;  however, whether these spermatids have function of fertilization remains unknown. Several groups have reported that rodent type A spermatogonia and early male germ cells could differentiate into haploid cells when co-cultured with Sertoli cells. , However, gene expression patterns of spermatids derived from the type A spermatogonia were abnormal and no offspring was obtained by micro-insemination. Furthermore, the fertilization potential of those round spermatids was not tested, and the efficiency was very low. Human spermatogonia derived from nonobstructive azoospermic patients were coaxed to differentiate into haploid cells. Although the efficiency of differentiation was low, the round spermatid-like cells possessed normal chromosome status and could activate human oocytes after injection into the cytoplasm. Recently, a breakthrough has been reported that SSCs from freshly and cryopreserved neonatal mouse testes could produce spermatids and sperm with serum-free culture media. , It is worth noting that this sperm could give rise to healthy and reproductively competent offspring. We have recently induced SSCs from cryptorchid patients to differentiate into haploid spermatids with fertilization and developmental potentials,  which would provide an invaluable source of autologous male gametes for treating male infertility of azoospermia patients. Since gene expression patterns of human SSCs are different after short- and long-term culture,  it is of great significance to develop efficient approaches for maintaining self-renewal and differentiation of SSCs. Spermatogonial stem cells have previously been considered unipotent because they are only committed to produce sperm in the course of normal development. However, several lines of evidence suggest that SSCs can acquire pluripotency. First, teratomas which contain derivatives of all three germ layers occur exclusively in the gonads,  and ES-like cells derived from SSCs in culture with certain growth factor could form teratomas; second, primordial germ cells (PGCs) which differentiate into gonocyte and subsequently into SSCs can produce embryonic germ cells that are similar to ES cells in potency. , Pluripotency of germ cells can be maintained postnatal. Therefore, investigators propose that SSCs are pluripotent. Great efforts from a number of pioneering studies have proven this notion. Lastly and more importantly, numerous groups have demonstrated that SSCs both from mouse and human testis could be induced to become ES-like cells that differentiated into derivatives of three embryonic germ layers ([Table 2]). ,,,, In 2004, pluripotent ES-like cells were first generated from SSCs of neonatal mice by Dr. Shinohara and colleagues when they cultured SSCs in GS cells medium with addition of GDNF, bFGF, EGF, and LIF. Notably, These ES-like cells could differentiate into various types of cells, e.g. hematopoietic cells, vascular cells, and spontaneously beating myocytes. Interestingly, more neural lineage cells and heart muscle cell colonies from ES-like cells were found than from ES cells. Typical teratomas and chimerism were seen in ES-like cells derived from SSCs and there were no significant histological differences from teratomas derived from ES cells. These findings strongly implicate that neonatal mouse SSCs can acquire pluripotency. ES-like cells derived from adult mouse testis were also successfully achieved. Their phenotypic characteristics and gene expression profiles were similar to ES-like cells induced by Dr. Shinohara group. ES-like cells derived from adult mice could different into ectodermal-, mesodermal- and endodermal-derived tissues and they produced mature teratomas and chimaeric mice with live offspring, a gold standard for pluripotency. In 2007, ES-like cells were induced from GPR125 + germline progenitors of adult mice, and they produced cells and tissues of three germ layers and could contribute to chimera embryos. Although different induction protocols were used, ES-like cells were uniformly formed from neonatal and adult mouse testes, reflecting that SSCs become pluripotent ES-like cells. On the other hand, due to no specific and unique marker for SSCs, highly purified SSCs were rather hard to obtain, which pose several questions, such as the origin of ES-like cells and the dedifferentiation mechanism. Kim et al. identified three transitional stages during SSC dedifferentiation to ES-like cells, including SSC stage, intermediate state SSCs, and ES-like morphology stage,  which might be helpful for better understanding the mechanisms controlling the dedifferentiation of SSCs to ES-like cells. A number of groups attempted to obtain autologous ES-like cells from human SSCs. ,,, Excitingly, Conrad et al. first demonstrated the successful establishment of pluripotent ES-like cells derived from spermatogonial cells of adult human testis. They obtained a highly pure SSC population by using CD49f and followed by sequential matrix selection with collagen and laminin, which has important significance to define the origin of ES-like cells. Human ES-like cells were generated from human SSCs with pluripotent characteristics and expression profiles similar to human ES cells when they were cultured with LIF. Human ES-like cells derived from SSCs could form a teratoma. Derivation of human ES-like cells has also been achieved from a testis biopsy or donor testes. , Although these human ES-like cells expressed markers of pluripotency and formed embryoid bodies (EBs), they didn't produce large teratomas. It is speculated that human ES-like cells may not have been reprogrammed sufficiently to produce teratomas, which might be a great merit to clinical application of SSCs. As such, human SSCs derived ES-like cells can be used to generate various kinds of cells for cell-based therapy and tissue engineering for human diseases. Importantly, the dedifferentiation of SSCs to ES-like cells doesn't involve virus vectors and ethical issues, which is much safer compared to human iPS cells or human ES cells. Spermatogonial stem cells arise from PGCs and they share similar expression of certain key genes (e.g. Oct-4 and Nanog) for ES cells. This indicates that the closest equivalent of ES cells in vivo is probably SSCs. Since SSCs can acquire pluripotency to become ES-like cells that subsequently differentiate into other lineage tissues, it is reasonable to presume that SSCs can directly transdifferentiate into other cell types without the pluripotent status. Boulanger and colleagues direct the transdifferentiation of testicular stem cells into functional mammary epithelial cells. However, the prerequisite is that they must mix spermatogenic cells with dispersed mammary epithelial cells, followed by transplanting them into the mammary fat pad. Engraftment of SSCs alone cannot form mammary epithelium, which suggests that SSCs can't transit to the mammary epithelium de novo. It has been reported that SSCs-enriched cells alone from neonatal mice transdifferentiate directly into tissues of all three germ layers, including prostatic, uterine, and skin epithelium. Furthermore, the organs and tissues transdifferentiated from SSCs expressed molecular, histological, and functional markers of the appropriate epithelium. Engraftment of SSCs can promote recovery in a rat Parkinson's disease model, and rat SSCs transdifferentiate to functional dopaminergic neuron-like cells via mesenchymal-epithelial interactions. Importantly, we have recently demonstrated that mouse SSCs are able to transdifferentiate directly into morphological, phenotypic, and functional hepatocyte-like cells when they are cultured with several growth factors in vitro. SSCs first converted into hepatic stem-like cells which subsequently differentiate into small hepatocytes and mature hepatocyte-like cells. Notably, we did not detect the gene expression for ES cells in the whole transition process, such as SSEA-1, SSEA-4, Nanog and TRA-1-81, which suggests that no ES-like cells was formed during the transdifferentiation process. Very recently, we have induced the transdifferentiation of mouse SSCs into functional dopaminergic neurons in vitro (unpublished data). As illustrated in [Figure 2], SSCs can give rise to a wide range of other type cells directly, which implies that they have important significance in regenerative medicine. First of all, the direct transdifferentiation of SSCs to mature and functional cells without the process of de-differentiation to ES-like cells and EB formation could simplify the reprogramming procedure of cells. Secondly, the conversion of SSCs using growth factors without gene modification could be much safer to generate mature cells for cell therapy and tissue engineering for human disease. Nevertheless, there are several issues to be defined prior to the application of cells derived from SSCs in clinic. First, the mechanisms of direct transdifferentiation are poorly understood. One concept is that there is a distinct subpopulation of pluripotent SSCs that can direct transdifferentiate into cells of another lineage. Izadyar et al. have identified two distinct populations in the GS cells, and only the POU5F1 + /c-KIT + cells are pluripotent. Another viewpoint is that all SSCs are capable of becoming pluripotent once removed from their niche. It is possible that the pluripotency of SSCs is repressed by the seminiferous tubular microenvironment in which they reside. Once outside of this niche, they recover original characteristics and convert to another lineage depending on the particular niche in which they are placed. Third, the necessary prerequisite to clinical application is to obtaining sufficient numbers of highly purified SSCs from human testis. Therefore, it would be crucial to identify speciﬁc and unique SSC markers. We have isolated human SSCs using 2-step enzymatic digestion and magnetic-activated cell sorting,  and notably, the isolated SSCs can be cultured in an undifferentiated state for 2 weeks. Nevertheless, culture condition needs to be optimized for long-term survival and expansion of human SSCs. Finally, it is important to explore the optimal induction protocols with higher transdifferentiation efficiency of SSCs to mature and functional cells. Enough transition cells from a limited number of SSCs are necessary for cell-based transplantation therapy. Therefore, extensive studies are required to eliminate those hurdles. Figure 2: The origin, dedifferentiation and transdifferentiation of spermatogonial stem cells (SSCs). SSCs are derived from primordial germ cells whose precursors are formed in the epiblast. Human and rodent SSCs can dedifferentiate to become embryonic stem-like cells that give rise to numerous cells of all three germ layers, e.g. neurons, pancreatic cells and muscle cells. Notably, SSCs from neonatal mice can directly transdifferentiate into a variety of cell types including prostatic, uterine, skin epithelium, and mature hepatocyte-like cells. However, whether human and adult mouse SSCs can directly transdifferentiate to other lineage cells remains to be defined (as indicated as question marks). As addressed above, SSCs represent a novel and significant cell source for both reproductive and regenerative medicine, due to their unlimited potentials including pluripotency, self-renewal, differentiation, and transdifferentiation. Generation of mature and functional cells from SSCs have certain advantages over ES cells and iPS cells, including no ethical concern, lower frequency of tumorigenesis, and no immune rejection. On the other hand, certain issues await to be clarified, e.g. the dedifferentiation and transdifferentiation mechanisms, optimal induction protocols, and origin of the ES-like cells. Due to no specific and unique marker available for SSCs, the true cellular origin of ES-like cells remains controversial. ,, Given the rapid progress in SSC research, it is no doubt that SSCs would be eventually utilized from the bench to bedside in the near future. ZH designed the outline of the manuscript. ZC, ZL and ZH wrote the manuscript, and ZH finalized and approved the manuscript. This study was supported by key grants from National Natural Science Foundation of China (31230048) and Chinese Ministry of Science and Technology (2013CB947901, 2014CB943101), a grant from National Natural Science Foundation of China (31171422), The Program for Professor of Special Appointment (Eastern Scholar) at Shanghai Institutions of Higher Learning (2012.53), a key grant from the Science and Technology Commission of Shanghai Municipality (12JC1405900), Key Discipline and Specialty Foundation of Shanghai Municipal Commission of Health and Family Planning, and Shanghai Pujiang Program (11PJ1406400). Thomson JA, Itskovitz-Eldor J, Shapiro SS, Waknitz MA, Swiergiel JJ, et al. Embryonic stem cell lines derived from human blastocysts. Science 1998; 282: 1145-7. Takahashi K, Yamanaka S. Induction of pluripotent stem cells from mouse embryonic and adult fibroblast cultures by defined factors. Cell 2006; 126: 663-76. Viswanathan P, Gupta S. New directions for cell-based therapies in acute liver failure. J Hepatol 2012; 57: 913-5. Blum B, Benvenisty N. The tumorigenicity of human embryonic stem cells. Adv Cancer Res 2008; 100: 133-58. Kanatsu-Shinohara M, Shinohara T. The germ of pluripotency. Nat Biotechnol 2006; 24: 663-4. Brignier AC, Gewirtz AM. Embryonic and adult stem cell therapy. J Allergy Clin Immunol 2010; 125: S336-44. Simon L, Hess RA, Cooke PS. 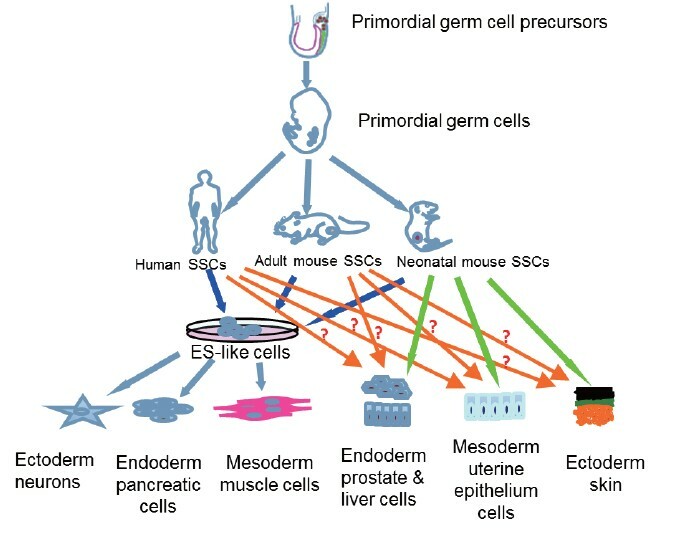 Spermatogonial stem cells, in vivo transdifferentiation and human regenerative medicine. Expert Opin Biol Ther 2010; 10: 519-30. Zhu Y, Hu HL, Li P, Yang S, Zhang W, et al. Generation of male germ cells from induced pluripotent stem cells (iPS cells): an in vitro and in vivo study. Asian J Androl 2012; 14: 574-9. Kanatsu-Shinohara M, Shinohara T. Spermatogonial stem cell self-renewal and development. Annu Rev Cell Dev Biol 2013; 29: 163-87. Kanatsu-Shinohara M, Inoue K, Lee J, Yoshimoto M, Ogonuki N, et al. Generation of pluripotent stem cells from neonatal mouse testis. Cell 2004; 119: 1001-12. Yang S, Ping P, Ma M, Li P, Tian R, et al. Generation of haploid spermatids with fertilization and development capacity from human spermatogonial stem cells of cryptorchid patients. Stem Cell Reports 2014; 3: 663-75. Guan K, Nayernia K, Maier LS, Wagner S, Dressel R, et al. Pluripotency of spermatogonial stem cells from adult mouse testis. Nature 2006; 440: 1199-203. Conrad S, Renninger M, Hennenlotter J, Wiesner T, Just L, et al. Generation of pluripotent stem cells from adult human testis. Nature 2008; 456: 344-9. Mizrak SC, Chikhovskaya JV, Sadri-Ardekani H, van Daalen S, Korver CM, et al. Embryonic stem cell-like cells derived from adult human testis. Hum Reprod 2010; 25: 158-67. Simon L, Ekman GC, Kostereva N, Zhang Z, Hess RA, et al. Direct transdifferentiation of stem/progenitor spermatogonia into reproductive and nonreproductive tissues of all germ layers. Stem Cells 2009; 27: 1666-75. Zhang Z, Gong Y, Guo Y, Hai Y, Yang H, et al. Direct transdifferentiation of spermatogonial stem cells to morphological, phenotypic and functional hepatocyte-like cells via the ERK1/2 and Smad2/3 signaling pathways and the inactivation of cyclin A, cyclin B and cyclin E. Cell Commun Signal 2013; 11: 67. Seandel M, James D, Shmelkov SV, Falciatori I, Kim J, et al. Generation of functional multipotent adult stem cells from GPR125+germline progenitors. Nature 2007; 449: 346-50. Phillips BT, Gassei K, Orwig KE. Spermatogonial stem cell regulation and spermatogenesis. Philos Trans R Soc Lond B Biol Sci 2010; 365: 1663-78. Clermont Y, Bustos-Obregon E. Re-examination of spermatogonial renewal in the rat by means of seminiferous tubules mounted "in toto". Am J Anat 1968; 122: 237-47. Huckins C. The spermatogonial stem cell population in adult rats. I. Their morphology, proliferation and maturation. Anat Rec 1971; 169: 533-57. Oakberg EF. Spermatogonial stem-cell renewal in the mouse. Anat Rec 1971; 169: 515-31. Nagano M, Avarbock MR, Brinster RL. Pattern and kinetics of mouse donor spermatogonial stem cell colonization in recipient testes. Biol Reprod 1999; 60: 1429-36. Clermont Y. The cycle of the seminiferous epithelium in man. Am J Anat 1963; 112: 35-51. He Z, Kokkinaki M, Jiang J, Dobrinski I, Dym M. Isolation, characterization, and culture of human spermatogonia. Biol Reprod 2010; 82: 363-72. Guo Y, Hai Y, Gong Y, Li Z, He Z. Characterization, isolation, and culture of mouse and human spermatogonial stem cells. J Cell Physiol 2014; 229: 407-13. Hermann BP, Sukhwani M, Hansel MC, Orwig KE. Spermatogonial stem cells in higher primates: are there differences from those in rodents? Reproduction 2010; 139: 479-93. Hai Y, Hou J, Liu Y, Liu Y, Yang H, et al. The roles and regulation of Sertoli cells in fate determinations of spermatogonial stem cells and spermatogenesis. Semin Cell Dev Biol 2014; 29: 66-75. Kiger AA, Jones DL, Schulz C, Rogers MB, Fuller MT. Stem cell self-renewal specified by JAK-STAT activation in response to a support cell cue. Science 2001; 294: 2542-5. Oatley JM, Kaucher AV, Avarbock MR, Brinster RL. Regulation of mouse spermatogonial stem cell differentiation by STAT3 signaling. Biol Reprod 2010; 83: 427-33. He Z, Jiang J, Kokkinaki M, Golestaneh N, Hofmann MC, et al. Gdnf upregulates c-Fos transcription via the Ras/Erk1/2 pathway to promote mouse spermatogonial stem cell proliferation. Stem Cells 2008; 26: 266-78. Zhang Y, Wang S, Wang X, Liao S, Wu Y, et al. Endogenously produced FGF2 is essential for the survival and proliferation of cultured mouse spermatogonial stem cells. Cell Res 2012; 22: 773-6. Pellegrini M, Grimaldi P, Rossi P, Geremia R, Dolci S. Developmental expression of BMP4/ALK3/SMAD5 signaling pathway in the mouse testis: a potential role of BMP4 in spermatogonia differentiation. J Cell Sci 2003; 116: 3363-72. Feng LX, Chen Y, Dettin L, Pera RA, Herr JC, et al. Generation and in vitro differentiation of a spermatogonial cell line. Science 2002; 297: 392-5. Meng X, Lindahl M, Hyvönen ME, Parvinen M, de Rooij DG, et al. Regulation of cell fate decision of undifferentiated spermatogonia by GDNF. Science 2000; 287: 1489-93. Wu X, Oatley JM, Oatley MJ, Kaucher AV, Avarbock MR, et al. The POU domain transcription factor POU3F1 is an important intrinsic regulator of GDNF-induced survival and self-renewal of mouse spermatogonial stem cells. Biol Reprod 2010; 82: 1103-11. Kadam PH, Kala S, Agrawal H, Singh KP, Singh MK, et al. Effects of glial cell line-derived neurotrophic factor, fibroblast growth factor 2 and epidermal growth factor on proliferation and the expression of some genes in buffalo (Bubalus bubalis) spermatogonial cells. Reprod Fertil Dev 2013; 25: 1149-57. Kanatsu-Shinohara M, Ogonuki N, Inoue K, Miki H, Ogura A, et al. Long-term proliferation in culture and germline transmission of mouse male germline stem cells. Biol Reprod 2003; 69: 612-6. Ara T, Nakamura Y, Egawa T, Sugiyama T, Abe K, et al. Impaired colonization of the gonads by primordial germ cells in mice lacking a chemokine, stromal cell-derived factor-1 (SDF-1). Proc Natl Acad Sci U S A 2003; 100: 5319-23. Kanatsu-Shinohara M, Inoue K, Takashima S, Takehashi M, Ogonuki N, et al. Reconstitution of mouse spermatogonial stem cell niches in culture. Cell Stem Cell 2012; 11: 567-78. Carlomagno G, van Bragt MP, Korver CM, Repping S, de Rooij DG, et al. BMP4-induced differentiation of a rat spermatogonial stem cell line causes changes in its cell adhesion properties. Biol Reprod 2010; 83: 742-9. Li Y, Zhang Y, Zhang X, Sun J, Hao J. BMP4/Smad signaling pathway induces the differentiation of mouse spermatogonial stem cells via upregulation of Sohlh2. Anat Rec (Hoboken) 2014; 297: 749-57. Blume-Jensen P, Jiang G, Hyman R, Lee KF, O'Gorman S, et al. Kit/stem cell factor receptor-induced activation of phosphatidylinositol 3'- kinase is essential for male fertility. Nat Genet 2000; 24: 157-62. Dym M. Spermatogonial stem cells of the testis. Proc Natl Acad Sci U S A 1994; 91: 11287-9. Zhang L, Tang J, Haines CJ, Feng H, Lai L, et al. c-kit expression profile and regulatory factors during spermatogonial stem cell differentiation. BMC Dev Biol 2013; 13: 38. Vernet N, Dennefeld C, Rochette-Egly C, Oulad-Abdelghani M, Chambon P, et al. Retinoic acid metabolism and signaling pathways in the adult and developing mouse testis. Endocrinology 2006; 147: 96-110. Griswold MD, Hogarth CA, Bowles J, Koopman P. Initiating meiosis: the case for retinoic acid. Biol Reprod 2012; 86: 35. Rossi P, Dolci S. Paracrine mechanisms involved in the control of early stages of Mammalian spermatogenesis. Front Endocrinol (Lausanne) 2013; 4: 181. Staub C. A century of research on Mammalian male germ cell meiotic differentiation in vitro. J Androl 2001; 22: 911-26. Griswold MD. Making male gametes in culture. Proc Natl Acad Sci U S A 2012; 109: 16762-3. Goldschmidt R. Some experiments on Spermatogenesis in vitro. Proc Natl Acad Sci U S A 1915; 1: 220-2. Champy C.Quelques résultats de la méthode de culture des tissus. Arch Zoolog Exp Gen 1920; 60: 461-500. Martinovitch PN. Development in vitro of the mammalian gonad. Nature 1937; 139: 413. Trowell OA. The culture of mature organs in a synthetic medium. Exp Cell Res 1959; 16: 118-47. Steinberger A, Steinberger E, Perloff WH. Mammalian testes in organ culture. Exp Cell Res 1964; 36: 19-27. Steinberger E. Maintenance of adult human testicular tissue in culture. Anat Rec (Hoboken) 1967; 157: 327-8. Ghatnekar R, Lima-de-faria A, Rubin S, Menander K. Development of juman male meiosis in vitro. Hereditas 1974; 78: 265-72. Boitani C, Politi MG, Menna T. Spermatogonial cell proliferation in organ culture of immature rat testis. Biol Reprod 1993; 48: 761-7. Sato T, Katagiri K, Kubota Y, Ogawa T. In vitro sperm production from mouse spermatogonial stem cell lines using an organ culture method. Nat Protoc 2013; 8: 2098-104. Tres LL, Kierszenbaum AL. Viability of rat spermatogenic cells in vitro is facilitated by their coculture with Sertoli cells in serum-free hormone-supplemented medium. Proc Natl Acad Sci U S A 1983; 80: 3377-81. Hofmann MC, Hess RA, Goldberg E, Millán JL. Immortalized germ cells undergo meiosis in vitro. Proc Natl Acad Sci U S A 1994; 91: 5533-7. Sousa M, Cremades N, Alves C, Silva J, Barros A. Developmental potential of human spermatogenic cells co-cultured with Sertoli cells. Hum Reprod 2002; 17: 161-72. Iwanami Y, Kobayashi T, Kato M, Hirabayashi M, Hochi S. Characteristics of rat round spermatids differentiated from spermatogonial cells during co-culture with Sertoli cells, assessed by flow cytometry, microinsemination and RT-PCR. Theriogenology 2006; 65: 288-98. Lee DR, Kim KS, Yang YH, Oh HS, Lee SH, et al. Isolation of male germ stem cell-like cells from testicular tissue of non-obstructive azoospermic patients and differentiation into haploid male germ cells in vitro. Hum Reprod 2006; 21: 471-6. Sato T, Katagiri K, Gohbara A, Inoue K, Ogonuki N, et al. In vitro production of functional sperm in cultured neonatal mouse testes. Nature 2011; 471: 504-7. Conrad S, Azizi H, Hatami M, Kubista M, Bonin M, et al. Differential gene expression profiling of enriched human spermatogonia after short- and long-term culture. Biomed Res Int 2014; 2014: 138350. Stevens LC. Spontaneous and experimentally induced testicular teratomas in mice. Cell Differ 1984; 15: 69-74. Shamblott MJ, Axelman J, Wang S, Bugg EM, Littlefield JW, et al. Derivation of pluripotent stem cells from cultured human primordial germ cells. Proc Natl Acad Sci U S A 1998; 95: 13726-31. Matsui Y, Zsebo K, Hogan BL. Derivation of pluripotential embryonic stem cells from murine primordial germ cells in culture. Cell 1992; 70: 841-7. Kim HJ, Lee HJ, Lim JJ, Kwak KH, Kim JS, et al. Identification of an intermediate state as spermatogonial stem cells reprogram to multipotent cells. Mol Cells 2010; 29: 519-26. Kossack N, Meneses J, Shefi S, Nguyen HN, Chavez S, et al. Isolation and characterization of pluripotent human spermatogonial stem cell-derived cells. Stem Cells 2009; 27: 138-49. Golestaneh N, Kokkinaki M, Pant D, Jiang J, DeStefano D, et al. Pluripotent stem cells derived from adult human testes. Stem Cells Dev 2009; 18: 1115-26. Zwaka TP, Thomson JA. A germ cell origin of embryonic stem cells? Development 2005; 132: 227-33. Boulanger CA, Mack DL, Booth BW, Smith GH. Interaction with the mammary microenvironment redirects spermatogenic cell fate in vivo. Proc Natl Acad Sci U S A 2007; 104: 3871-6. Liu T, Gong Z, Hou L, Huang Y. The induction of rat spermatogonial stem cells into neuronal-like cells and behavioral recovery following transplantation in a rat Parkinson's disease model. Int J Mol Med 2012; 29: 239-44. Izadyar F, Pau F, Marh J, Slepko N, Wang T, et al. Generation of multipotent cell lines from a distinct population of male germ line stem cells. Reproduction 2008; 135: 771-84. Chikhovskaya JV, Jonker MJ, Meissner A, Breit TM, Repping S, et al. Human testis-derived embryonic stem cell-like cells are not pluripotent, but possess potential of mesenchymal progenitors. Hum Reprod 2012; 27: 210-21. Tapia N, Araúzo-Bravo MJ, Ko K, Schöler HR. Concise review: challenging the pluripotency of human testis-derived ESC-like cells. Stem Cells 2011; 29: 1165-9. Ko K, Araúzo-Bravo MJ, Tapia N, Kim J, Lin Q, et al. Human adult germline stem cells in question. Nature 2010; 465: E1.